The Ancient One: I never saw your future, only its possibilities. You have such a capacity for goodness. You’ve always excelled, but not because you crave success but because of your fear of failure. Dr. Stephen Strange: It’s what made me a great doctor. The Ancient One: It’s precisely what’s kept you from greatness. Arrogance and fear still keep you from learning the simplest and most significant lesson of all. 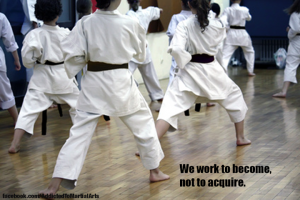 I had a conversation with another Taekwondo teacher that fit this thought. 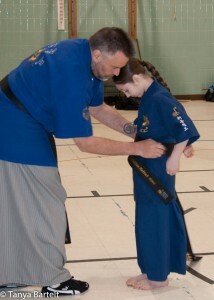 As we chatted, the thought came up about what Yellow Belts are like. It seems that about 3-6 months into training, students KNOW everything there is to know about Taekwondo and they’re ready to teach it. The arrogance of youth? As they continue through the colored belt ranks, this can continue because of the natural athleticism. Young students have the ability to pick things up quickly but can miss some of the real learning that is deeper in the material. This can create a false sense of success. If things are too easy, nothing is really learned. Things done too easily can cause the student to get bored and more arrogant, which leads to even less effort being applied to learning. The fear of youth can also affect the student’s learning. How often have they already heard that they can’t do something? How often have they tried but failed and were not encouraged to keep trying until they achieved the goal? Their whole life is filled with a variety of support and criticism that begins to mold them even before they start training in a martial art. Every so often I overhear before class starts something along the line of “Oh, I can’t do [blank], so why should I even try.” It becomes a fine line between encouraging a student and pushing too hard. Arrogance or Fear or both may be found in children. This can be worked on to challenge the child to develop respect and courage. Their development is a major goal of teaching children. Finding these traits in an adult is even more sad. Many years of behavior reinforcing these characteristics make it very difficult to redirect them toward respect and courage..